John Stansfield teaches Community Practice at Unitec in Auckland where they teach both undergraduate and post-graduate programmes in community development as well as social work and counselling. He’s worked extensively in community development in his own community – notably Waiheke Island – as well as Palmerston North, Papua New Guinea and other Pacific islands. He is chairing the upcoming Aotearoa Community Development conference. Shane Welcome to the show John. John: Thank you very much, gentlemen. Shane: What we normally do is start off with a little bit about your past. Where were you born John? John: I was born at a tragically early age in Auckland and I grew up initially in Te Atatu which is a glorious suburb on the harbour, in the upper harbour. I went to school there and lived there until I was about a teen or so when my parents had some kind of crazy idea and moved just to the Bible belt of Mount Roskill which amongst the many facilities it didn’t have, it didn’t even have a pub. I became bored with it quite quickly and at 18 I decamped and went and lived in the bush in Papua New Guinea for eighteen or twenty months or so. As far as growing up I’m still doing it. It’s been a long and difficult childhood. Shane: You went to Papua New Guinea and then you came back to New Zealand obviously at some point. What brought you back and what did you learn in Papua New Guinea? John: Papua New Guinea was a transformative experience. I went there in 1976. It was a newly independent country. In fact tried to go in 1975 just as it became independent but they didn’t have embassies, you couldn’t get visas and it was terribly difficult. I got there and I worked as a motor mechanic in training, people in small engines in the bush in what’s now called Sandaun Province which was then the West Sepik as a volunteer and lived very simply in villages. Met all kinds of fabulous, fabulous characters. The ‘land of the unexpected’ as they call Papua New Guinea has a way of seeping into you and calling you back. I think I’ve been back more than twenty times since I left. I was fortunate enough, in fact, to go back and do some teaching up there, then later to go back and do some work for Oxfam. It’s a fabulous, fabulous country. John: Well, in common with most 18 year old males it was not a rational decision. I think it was something which came about as an argument in a pub about whether I should join this movement to not have beer and pies on a Friday and put the money into aid and development, and being fond of beer and pies as my girth will tell you, I had to argue against it all. Actually I argue against just about anything, and said I’d far rather do something more practical with my skills and somebody called my bluff and said, “Actually there’s this unpaid job in the bush in the mosquito infested hell hole.” The West Sepik has the best mosquitoes in the world. They need clearance from civil aviation to land. They frequently make off with calves and small children. My bluff was called and I couldn’t back out and I went. Shane: That must have been an amazing experience. Obviously you’re extremely fond of the country and the people. You came back to New Zealand what was your plan when you came back? Did you have a plan? John: Sitting around in the bush with not too much to do but chew beetle nut and occasionally get a bit of wireless you get a bit of time to think and I decided that I really wanted to come back and study social work, but particularly what I thought was community social work which turned out to be community development. Just to add familiar with the term, I think of it as community development is the crucible of democracy. It’s the place where citizens come together to share their dreams and plan their common futures. It’s a way of collectively organising to make life better and that became my discipline and I’ve kept it for the rest of my life, and something I’m enormously fond of and very proud of and which defines me. These days I’m a senior lecturer community development, having become too old for useful work, I’ve returned to academia where it’s not object to advancement. I’m on the Board of the International Association of Community Development, and I’m chairing the Aotearoa Association and chairing the National Conference, and I’ve been fortunate enough to go on tour in March last year through India with twenty other community development practitioners. It’s fabulous. It’s better than religion. Shane: Community development obviously is different depending what communities you’re in. The community in Papua New Guinea might be different to what community here or in Ireland or in India. What are the common themes and what are the differences and what do you have to be careful of going in…? John: The great trap in community development is you really can’t have much of an agenda of your own. You have to help people find the agenda that they want. To give you an example, I chair a fabulous little organisation called the Waiheke Resources Trust. It does all kinds of fabulous projects in community development. We got a little grant here at council to see whether we could do something about food waste. Almost all the work that’s done on food waste is done after you’ve wasted the food. It’s a deeply stupid place to intervene in a problem. Myself and a young colleague intern wrote a paper doing a Lit review from around the world on food waste and said, “You got to start somewhere else”. We put this thing through to the Ministry for the Environment and they were pretty excited about it. Then they had a change of leadership and no one was really excited again. We pitched away and did a little trial at home. Ultimately we got the local council to say, “We’ll put some money behind you. Go and see what you can do.” They sent us off to a fabulous community we chose on Waiheke called Blackpool. Blackpool has a resident’s association which exists under the name BRA. The Blackpool Residents Association that came together when the community was flooded some years earlier. It had been little bit in abeyance. This could be the severely career limiting approach but actually we worked with that community and they got a pub, it’s a fantastic thing. It’s called the Dog and Pony and it pops up. It’s a pop-up pub, it pops up in a public building every few weeks and people bring their biscuits and their nibbles and their bottle of wine or their homemade beer and their violin and they have a fabulous time in their own community and they walk to it, walk home. No one gets killed in the process. The purpose of that story is to illustrate how it’s actually got to be the community’s decision what they want. Having got there and had the pub delivered, we were able to see who leaders were in that community and get alongside them and say, “Can we do something around food waste?” We did a fantastic trial there and really significantly reduced the waste of food and learned a whole lot that we’re now rolling out in other communities. Sam: Is that easier or harder on an island? John: It’s much easier on an island. Everything’s easier on an island. Not everything, you would run out of water here, that’s not easier. Your relationships are far more intimate. Everybody’s recycled. You have to be a little bit more both self-reliant and collectively reliant on each other to make things work. There’s an opening. I think on this island it’s a very proud history of concern about the environment and of being unafraid to stand up and be counted on things. We were the first place in New Zealand to be nuclear free. I think we were the first council to declare ourselves GE free. When the boats left for Moruroa, they largely came from Waiheke. We’re a great bunch. It’s very easy to find other people of like mind in this community to do something that’s better for everyone. Sam: Then you have a council that is representing all of Auckland and does things like destroy your waste management system. John: You’ve got to have the time sense of a geologist to appreciate these things you see. We originally had a couple of roads boards here, that then got made into the Waiheke County Council. I remember the Waiheke County Council very fondly. A place where politics became a blood sport and source of local entertainment where people jostled to get a seat at the local council meeting, try deftly to be upwind of Fred Burrock who hadn’t washed. We were one fantastic county. We did things like say, “It’s our island and we’re going to green it.” They built their own nursery, employed four or five islanders and every ratepayer could front up and get three trees any time he liked. They get your fruit trees and fruit trees were planted on the road verges, in public parks and all over the place. That was fabulous. Then it was compulsory amalgamated with Auckland City Council which is no longer. Waiheke revolted of course because the first thing that the good burghers of Rocky Bay knew about the amalgamation is they came down their muddy track with the carefully sorted recycling was a big flash new council truck going past and threw the whole lot into a compactor and took it off to a hole in the ground. We were pretty vexed and aggrieved about that. When the Royal Commission on the Governance of Auckland asked the then 1.4 million people of the region to comment on their plan, 28.8% of all submissions came from the 0.8% of the people who lived on Waiheke who demanded that the commission come here and explain themselves about how we were going to do without local governance. Ourselves and the Great Barrier community won their own local governments back. Yes, it’s true that we did lose the fabulous social enterprise in rubbish but we’ll win it back. We [inaudible 00:12:46], we can write. Shane: It sounds like there was already a community there to work with. How do you development a community where the one doesn’t already exist or it’s very fragile? John: There’s been some great work done around that in New Zealand and overseas. In fact, I had a cup of tea this morning with my very good friend, Gavin Rooney who at 76 has just retired from being a senior lecturer in Community Development. He was the first local authority community worker employed in New Zealand. They put him in the new Nappy Alley suburbs of Massey out in West Auckland. When he finished his term, they didn’t appoint a new one, the council, because they had so much trouble with the last one. He just very patiently went around, getting to know people, linking people up. Getting conversations going about things. Similarly a great New Zealand community worker was Wendy Craig who worked in the Takaro community of Palmerston North. Was very famous there when the hospital board were considering closing a maternity unit. Wendy got a whole bunch of mothers with crying babies to go to the hospital board meeting. I think it was a bit of judicious bottom pinching during the meeting because the meeting had to be abandoned there was so many crying babies. The board got the message, they shouldn’t mess with the women of Takaro. It’s a gentle process of getting to know people, finding their interests, linking them up with each other. Making it possible for people to believe that they can control their own futures and have a say. Once you get to that point it’s pretty unstoppable. Sam: We visited Oamaru last year, or the year before, they have got a really strong transition town movement. They’ve got a really good summer school and they’ve got their, what do they call it…The waste recycling system, they’re planting trees on every street frontage. Whole pile of things. We thought, “This is amazing. We have to go and find out they’re managing this. How is the whole town in behind transitional Oamaru?” It turns out it’s not. There’s about six people doing everything but what they’re doing is doing things that other people would get engaged in. Even if they think the transitional town people are a bit weird, they still recognise that having fruit trees in front of their house is a good thing. John: Transition towns, it’s somewhat kind of like a brand really. They came to Waiheke and the next thing we noticed was all kinds of things we’d already been doing with transition town things. That’s good. They’re able to reach a different constituency. Every little tribe that marches in a similar direction that reaches a new constituency makes us all collectively stronger. It’s great. Kaikoura is another place that’s fabulous. Kaikoura, when I was down there last week helping sort the rubbish on the line in the recycling plant because her brother, Robbie Roach, is the manager of Innovative Waste Kaikoura. He is facing a mountain of construction and demolition waste and working out has a community they can make the best of that. Wonderful. There is actually a lot of be said for rubbish. I started to think that we’ve got to grab hold of all the rubbish and keep it for the poor before the rich find out how bloody valuable it is. Sam: One time I visited Waiheke and the rubbish was sitting in some sort of carton or big crate thing on the wharf. I thought, “All the people that go over the wharf can see this is the result of our through-put.” It’s nice and visible. You don’t need to have a website or anything. Unfortunately that’s gone. My question though, was is there a tipping point of how much community engagement you need to actually make a difference? John: If I refer back to my good friend Wendy Craig, who’s a very wise woman. She said once, “If you’re fun to be with, they’ll always be people with you.” Two essential ingredients for good community development are fun, coupled with a deep seed irreverence, and food. If you put those two things together you can find ways to build bridges and get people engaged. Once people become engaged in their own neighbourhood and there’s oodles of research out that says people want to be more engaged and they want to do that locally. Somewhere where they live. We just seem to have built a social structure that’s going entirely in the wrong direction for that. Some clever marketing guru gets hold it, they’ll be community development on sale. I suppose there is a kind of tipping point but it’s a tipping point. It just takes a little bit of enthusiasm in pulling people together and it has its successes and its failures. It requires some judicious thinking about what would be good early successes because nothing succeeds like success. People’s experience of a win is very empowering. Sam: You’ve written about foreign issues. You write about gambling and the relationship between gambling and public health. What’s the cross over between that and the collective organising and community development we’ve been talking about? John: Sure. This second stint in academia. I was here in the mid-90s and I founded a graduate programme in not-for-profit management. I started to wonder, I actually wondered this on a beach with a great American guy called Tim McMain. We sat on a beach and wondered this together whether the biggest threat to biodiversity was not the loss of Hochstetter’s Frog, or the Maui dolphin, but the most important biodiversity was the biodiversity of thought. What I observed happening around the world in terms of governance and management was that there was starting to be a one true solution, one size fits all. Funnily enough it happened to be the one that culturally suited white men in suits from Boston. You saw other ways of doing and knowing and thinking being pushed out to the margins. When I looked at the impact of that on the community sector I became deeply concerned at the kind of corporatization that was happening all over the place that was actually driving out the most important thing we do in the community organisation which is giving people the opportunity to belong. Belonging is just really important for people and for healthy societies. If you don’t think it’s important, go to court on a Monday morning. You’re not going to find many playcentre mums. We started to think about this thing about actually the way we manage community organisations has to palpably different, it has to have its own kaupapa, it has to have its own culture. It has to have a consistency, because you don’t have the same tools. You don’t have the same money that you can incentivize and you don’t have the legislative power of the state. All you have is trying to get people to line up around some values. I did that for nine years and then I did a dangerous thing – I had a holiday. I woke up from that I thought, “I wonder if I’ll still be here, preaching on like this in thirty years time. I should go and find out if it works.” I looked for a broken community organisation which was the Problem Gambling Foundation. I was fortunate enough to be appointed their CEO, and I had a really fantastic five years. Learning about gambling and its impact. My thinking is very influenced by the late, great Bill Mollison who developed Permaculture. I’m sure some of your listeners will know about Bill and he and David Holmgrem’s work. When I got to the Problem Gambling Foundation, things were quite broken so I couldn’t hop into the track and blast off into the sunset. None of the gears worked, the wiring was buggered, and the finance system didn’t work. It was just a bloody mess. It was a lot of grunt work to be done for about three months. While I was doing that I decided I’d have a Masters level education in gambling. Every night I would read two or three hours worth of papers from around the world about gambling. What I quickly found out is that more than half of them had all the validity of 1950s tobacco research, and for exactly the same reason. Just as the tobacco companies corrupted the research sector by buying it, so had the gambling industry. That really made it hard. I didn’t know. I didn’t know what the answer was. I had to keep looking, keep looking, keep looking. One night about 10:00 I came across one statistic and it showed me that ten years earlier, no New Zealand women had come to treatment for gambling problems. Yet, now in 2003 this was, more than half the people coming were women. If you approach that bit of statistic with the traditional addictions lens, and addictions looks at the person who is harmed after the harm has happened and says, “What is the matter with the person?” Then the question you ask is what happened to New Zealand women that they all got so weak over ten years? Mine has not been a life which has been surrounded by weak New Zealand women. I tend to end up with the very mouthy, stroppy ones. There’s still time. It’s a species I’m interested I’m explore. I thought, “This just doesn’t make bloody sense.” I fell back on my trade union background, I thought, “If I’d gone to a mill and there were three blokes sitting around with their arms cut off, my first thing wouldn’t be to get them into a support group and say, “now come on you fellas, what happened in your earlier lives that caused you to cut your arms off?” Essentially that’s what we were doing with gamblers. We were getting people who would come in who were deeply harmed and saying, “This is your fault in some way.” It isn’t. The normal outcome of regular use of a pokie machine is that you’ll be harmed by it. It’s a deeply, deeply pernicious industry and it extracts money out of the communities that can least afford it. You follow the capital flows? It’s a transfer of wealth from the women to the men, from the brown to the white and from the poor to the rich. Once I understood that, I knew that it was deeply offensive and I could have a great deal of fun fighting it. It’s just like any other kind of plunder, environmental plunder or community plunder. Shane: Why has New Zealand’s society allowed that or constructed a system? This kind of gambling, for instance, isn’t simply legal back in Ireland and I was really shocked when I came over here to see the pokie machines and the casinos. What allowed that? What was the construct there? John: I’ve always wondered if in Ireland the reason it didn’t go ahead was because the church couldn’t find a way to control it. Just as an aside. The way gambling gets in everywhere is a bit of a standard method and it’s lies, deception and corruption. They have fantastic relationships with senior people in government. I can think of a fellow in a one man party, and I don’t mean David Seymour, who in his entire career in politics has never voted against the gambling industry, the liquor industry or the tobacco industry. He stands for Family First party. Think about that. Sam: What do you do about trying to change that behaviour if you’re taking that collective responsibility role that you’re talking about. The point is that it’s already normalised. John: People aren’t stupid. In fact what you see happening with the pokie industry up until the last two quarters is a poisoning of the well. There’s very few people in this country now who don’t know somebody or some family that’s been blighted by those machines. It’s really, really hard to walk into anywhere they are and imagine that there’s something glamorous going on. All you really have to do to fight against this is number one, tell the truth, and we tell the truth about it on a daily basis through a news feed called Today’s Stories that a wonderful woman named Donna in Auckland puts together every morning. Gets on my desk about 7 a.m. and it’s a summary of all the gambling stories in New Zealand and around the world. You find things like the second biggest motivator for organised fraud, white collar crime, and this is a top accounting firm study, is gambling. Unless you look at the charitable sector alone in which case it’s always the highest motivator. Gambling is only allowed in our society really for charitable purposes but the people most likely get harmed by the charities. When you start to tell that story repeatedly it starts to become true. The latest surveys by the Department of Internal Affairs now show that the majority of New Zealanders don’t think it’s a good idea to fund communities out of the gambling industry. While the minister, Minister Dunne, is desperately trying to liberalise the regime and ensure that pokie machines are a sustainable industry. You can’t put glitter on a turd. It just isn’t going to work. Ultimately, people will throw them out and I think we will look back on this period of our history with a sense of deep shame and say, “How did we allow that level of exploitation of our poorest and most vulnerable citizens.” Make no mistake it’s the poor who pay the price of pokie gambling. I put a picket on a pub in Manurewa years ago and they have 5.1 million dollars from that poor, poor, poor South Auckland suburb leave town. Some of the money went to charity, it went to the Otago Rugby Union, and the Canterbury Jockey Club. The horse owners which apparently is a sport. Not one red cent went back into that community yet there were moms dropping the kids off at school in their dressing gowns coming into that pub playing those machines. Desperate to try and win some of it back. Sam: Talking about stories and telling the truth, I’m thinking about now as we move very quickly into what’s being referred to as post-truth, or whatever. We’ve been having the same thing on a lesser level for quite a long time here about the story, it’s all right Jack, everything’s wonderful on Planet Key. Is that making it harder to engage communities because they’re being told so strongly that everything’s all right? John: Yeah. There’s certainly something very comforting about the news according to Mike Hoskins. It doesn’t really bear looking at. Put it in context to the States, I was in the States during the period of the conventions. I just couldn’t believe it. Come on, you people, you’re not stupid are you? What’s going on? You wonder how long it would be before particularly working class middle America wakes up and realises they’re seriously being duped. There is I think a real risk in our society in the decline in journalism. I don’t mean that journalists are any less than there ever were, great journalists in this country but there’s a hell of a lot less of them. They’ve got a hell of a lot less time to do their job. There’s a lot of stuff that’s just sliding by. I just about fell off the chair when I read that we were the least corrupt country in the world. Sam: You’ve written about gagging, I think in relation to Christchurch. Do you think we’ve got a problem with people in government, local government, national government, being told what they can and can’t say? We were a long time, many, many, many months with no income. Staring down the barrel of that thing. You can’t withhold medical treatment, which is what counselling services, from people in prison. That’s in breach of international human rights codes. We won’t participate with it. Boy, did that organisation get punished by the Ministry of Health for having an ethical position. They certainly did. They still got that ethical position I’m proud to say. Shane: Do other organisations look at that example and then think we’d better not cross government? John: Yeah. Absolutely. A terribly expensive case for an organisation to have to take. All brilliant work that was done by a fantastic team of lawyers but by golly it doesn’t come cheap. Just to preserve what you already had. Shane: What we’re saying is what we’re seeing happening in America in a radical and very clear way, has been happening slowly here for a long time? John: Yes, I do think some of that but I also think that we owe it to our communities not to be timid and not to self-censor. I can put up with being censored by the state, I can rebel against it, I can speak out against it, but I’m far more worried about people doing the Nervous Nellie and self-censoring to please. John: I was Head of Department, I’m happily now … Poor Robert Ford has that honour. I’m now Senior Lecturer in Community Development. Sam: Okay. You’re teaching people how to be community development practitioners. Sam: Are you training them to be trouble makers? Her group of them went off down and helped the McDonald’s workers fight the good fight against zero hours contracts. Then they lead a protest march to TV 3 and they got inside and occupied the building and had a wonderful time. Sat on the floor and slapped their thighs and said, “This is what democracy looks like,” and I was terribly, terribly proud of them because that’s how you build a people who will not be bowed. The risk that we have all around the world at the moment is that government’s lose the understanding that they government by consent and that that consent can be withdrawn. Sam: Those young graduates of yours, the ones you’ve trained to be trouble makers, they have to go into organisations that rely on government funding. Sam: How are they going to manage that tension? John: Life’s full of difficulties. I talked to one just the other day who did a TV show by posing as school children buying single cigarettes. She’s happily found work in a tobacco control agency. I think young people are actually pretty smart. What I observe happening around the place is some very good advocacy training is going on. I went out on Saturday night and I met Sandy, the producer of the documentary Beautiful Democracy which is about the young people who lead the TPPA protests. Gosh, my heart was so warmed by the fact that these young people were really deeply thinking about their tactics, what would work and trying things out. Doing fantastic research. 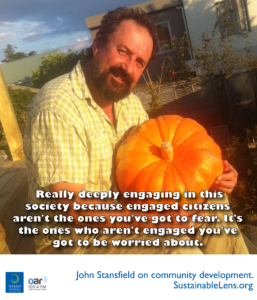 Really deeply engaging in this society because engaged citizens aren’t the ones you’ve got to fear. It’s the ones who aren’t engaged you’ve got to be worried about. John: I am. yes, it’s a fantastic honour. I’m thrilled to bits. Sam: What sort of things can we expect? I should say I’m going to it. John: It’s going to be fantastic, really is. We’ve got, as of this afternoon, 170-odd people from around the world coming. What we’re doing is we’re using a community development lens for by and large people are community activists, community development practitioners and academics and leaders. We’re using that to look at the United Nations have deemed Agenda 2030. Which is the goal of sustainable development. Ordinarily if you wanted to talk about the United Nations, you put me into a deep sleep instantly. The seventeen goals for sustainable development are a fifteen year plan for the whole world, and they are just about the most important things we could be dealing with. It’s ending poverty, it’s ending hunger. It’s about having gender equality, it’s about having good health care. It’s about having good education, and other things that you wouldn’t expect. Like access to clean and affordable energy. One of the guests who’s coming in is Kalyan Paul who’s from Pan Himalayan Grassroots Development Foundation and is from Ranikhet in the Almora District, Uttarakhand in the foothills of the Himalayas. I went up and visited him and he works with the forest dwellers and the people who live in the deep, deep valleys. We were talking about Agenda 2030 which brings together a lot of social goals with a lot of environmental goals. He said to me, “Look, it was inevitable. This is completely inevitable. We’ve known this would happen.” Where did he bloody know that sitting up here? He said, “You can’t protect the forest if the people have no fuel for their cooking. You simply can’t do it.” The only way we’ve managed to protect all this beautiful forest is by addressing the problem, and that is they built small biogas plants. They take the cow dung and human dung and produce gas which does the cooking and lighting. The houses don’t need to walk miles into the forest and cut the trees down. Then you can protect the forest. Very practical solutions but based on some really good deep thinking. This wonderful confluence of the social and the economic and the environmental. It’s a really exciting time because many people in community development actually have got a huge contribution to make to the way we take this stuff forward. Companies are looking at this stuff. One of the big multi-nationals, I can’t remember exactly the name. They probably made your toothpaste and soap this morning. They have so many tens of thousands that they give out in grants and they have so many thousand days a year of corporate volunteering. They just announced Agenda 2030, as of June all about volunteering, all about donations and everything, are going to be targeted on the seventeen sustainable development goals. All of our industries are going to be measured against their contributions to those goals. This is really big, big stuff. Sam: All right. We’re running out of time and I’ve got seven questions to ask. John: I’ll try to be brief. Sam: We’re going to have to rattle through them. What is your go-to definition of sustainability? John: Pass. I haven’t got a short one for that. The Brundtland Commission which is to consume today only so much as to ensure tomorrow can. Is still pretty good. Sam: That’ll do. How would you describe your sustainable super power? What is it you’re bringing to the good fight? John: A really good sense of fun, a deep reverence for food and a great love of people. Sam: I think I know how you’re going to answer this next question. Do you consider yourself to be an activist? John: Absolutely. Activism is the rent price that you pay for living on the planet. Sam: Have you always thought that? John: Pretty much I think. My mom would say so. She said I was this troublesome in primary school. Sam: Have you ever been a position where you couldn’t be? John: I’ve often been in a position where I couldn’t be as activist as I might like to be. I know some fabulous people and I was reflecting with Gavin this morning on an experience I had in a government committee meeting where I felt that the principle that was being applied was deeply, ethically wrong. The others stood with me, he lost it as a vote but when I put it out, impassioned it out, others stood with me. You go, okay, I just didn’t win it today. I’ve got to come back and be better next time. Sam: You said something that was deeply ethically wrong. Sam: Where did those ethics come from? John: Gosh. I think you get a lot of them from your mom. I know I get my sense of fairness from my mom. She’s still alive, she’s pretty smart. She knows that if she cut an apple, I’d want to have the biggest bit and my little brother get the smallest bit. She’d do the Solomon trick, she’d say, “You cut and he chooses.” Never seen the precision going into cutting an apple like that. Sam: Do you think that people like coming through school getting that stuff? John: You have your moments of despair about it. I have an absolutely 18 year daughter of whom I’m incredibly proud. She’s on every kind of activism there is. She is on so much more activism at 18 than I was that I feel very hopeful for the planet. Again, meeting Sandy on the weekend and looking at the film and the other film around indigenous housing and some of the young people coming through the programmes that were involved, I think there’s some pretty fabulous young people out there. Sam: What’s your daughter going to do with that? There’s not many programmes like the one you teach where we’re actively teaching people or even allowing people to be activists. John: She’s going off to Victoria University next year and I said, “Are you going to do politics?” She just looked at me, she said, “You don’t think I get enough politics at home?” She’s got a love of languages, she’s travelled, she’s Maori so she’s going to do some Maori studies and some law and some languages. Whatever she does and learn she’ll make a big difference with her life, I can just see it. Sam: What motivates you? What gets you out of bed in the morning? A pretty stunning view I must say. John: It is a stunning view. I leave it in the dark, can you believe it? I belt out of bed before 5, and I’m out of here by half past to go all the way to Henderson to do the job there. Lovely team of people that I work with. I think that most people want a job worth doing, they want a team worth belonging to and they want leadership worth following. Two out of three ain’t bad. Sam: That’s quite a commute. Sam: Ferry and then train? John: It’s currently either car or bicycle to the ferry. Then ferry and then most of the time it’s taking the little campaign car that we have because it’s got to live in a concrete bunker. At that time of the morning I can be in my office by 7 which gives me clear, early part of the day. When the new trains come and we’ve got a route that doesn’t go by Kazakhstan that might be an option. John: I’m really looking forward to the conference and that’s challenging on day by day basis. Got one of the young graduates managing that process. It’s just fantastic. A young woman that can take any pile of drivel that I put on the page and turn it into something that looks like a masterpiece, so that’s fabulous. After the conference I’m planning to do a major piece of research in New Zealand on the behaviour of funding organisations and the processes and how this does or does not contribute to innovative and sustainable funding relationships. I’m planning on doing that piece of work for a few years. I’m just finishing a piece of work on the living wage movement, and also helping on a project looking at South Kaipara community economic development scheme which is featuring in the conference. That is all pretty good. Sam: You’re a busy chap, especially with the dancing in the garden stuff? John: Dancing in the garden is a great deal of fun, yeah. They’re going to get a film maker there. He just as to look at me in a certain way and I can’t help myself. I become a total show-off really. The garden is very important to me. I have a great garden here, it’s still looking fabulous but we’re entering drought now so it’ll all be dead in a fortnight. Organic food, really, really important to me. Food’s really important. Sharing it with people. Sam: Two more questions unless I get distracted. Sam: If you could wave a magic wand and have a miracle occur by tomorrow morning what would it be? John: My standard reply to that is that every wish that would ever have would come true but I don’t think that’s going to wear in this occasion. Gosh. Would we have to fix the climate. That would have to be the top. The two problems we’re going to deal with are inequality and the climate. If we get those things stopped the rest of it’s a piece of cake. Sam: What’s the smallest thing that we could do that would have the biggest impact on either or both of those? John: I think if we all really looked at inequality in our society and started having a real discussion about it, and saying, “No, I don’t believe these Kiwis really want to have a third of children living in poverty.” That’s been able to perpetuate because we have not been having the conversation and we have to have that conversation really, really robustly. Sam: Last question before we get in trouble with the Buddhists, do you have any advice for our listeners? John: Live long, it’ll damn your enemies.